This is a common question that our customers at Organimi ask us often. In this article, we’ll cover a few quick and easy ways for you to convert a CSV file into an Excel file, complete with full columns in a single workbook. Additionally, we’ll provide some basic advice for how to handle issues when they arise, such as if the CSV file isn’t correctly displaying within the columns of the Excel sheet. If you need to transfer data from a CSV file to an Excel workbook, it can be an annoying problem. Often, we’ll have customers of ours that attempt to do so but end up with all sorts of errors and formatting issues that they did not account for. 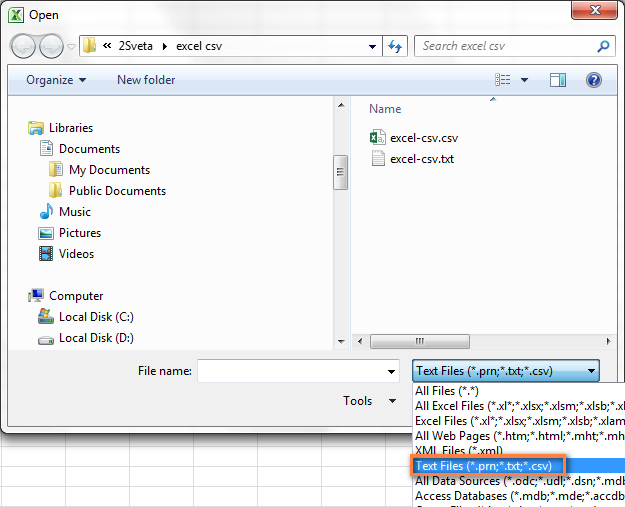 First, we’ll start by showing you how to open a CSV file in Excel. This is the simplest and most resistance-free way to open CSV data in an Excel worksheet. If you created a CSV file in another program or database software and would like to open it in Excel, you’re in luck! You can still open it as an Excel Workbook using the “Open” command in the “File” menu. However, there are some special considerations that you need to take into account when you open it. Keep in mind that opening a CSV file in Excel doesn’t actually change the file format. It just allows you to open your CSV file in the program and view the contents. There are other steps that you will have to take in order to create the full conversion. Step #3 — This will open the Open dialog box. When you see that pop up, select “Text Files (*.prn,*.txt,*.csv) from the drop-down list. This list will be visible in the lower right-hand corner of the box. Step #4 — Browse through your files to locate the CSV file. Open it by double clicking on the file. Once you have opened the file, Excel will try to open the file immediately. In the case of a .csv file, Excel should be able to open it and important the data into a new workbook without any problems. If you are opening a .txt file, you’ll have to go through the Import Text Wizard for the data to be located correctly. When Microsoft Excel opens your .csv file, it will use all of the default data from the settings to understand how to import the file and assign data to each of the columns in the workbook. 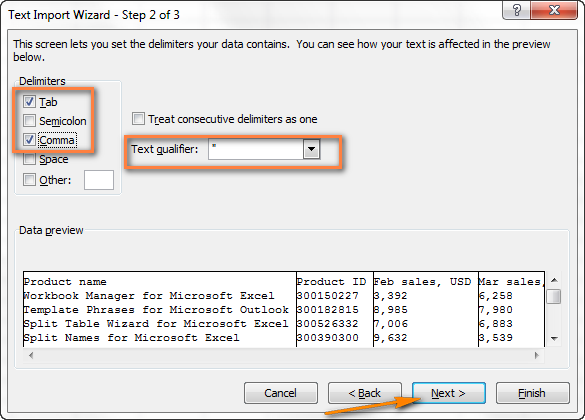 If you data has different formatting than the defaults within the program, you will have to use the Import Text Wizard instead. Different delimiters used to separate the different data fields from one another. The .csv file has a different format for dates that Excel can not read with default settings. You have converted numbers with leading zeroes and would like to preserve those leading zeroes when you load it into the Excel sheet. You would like to play around with the options to see what other options are available within the wizard. Excel will automatically open the Import Text Wizard screen for any file ending in the .txt extension. You can change the filetype of your document from .csv to .txt to get the screen to open if you would like. 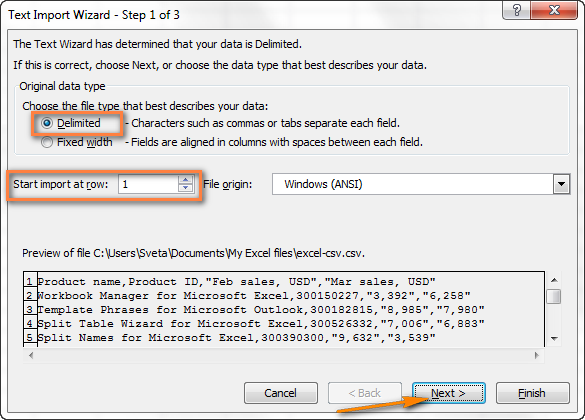 There are other options for importing CSV data into Excel as well. 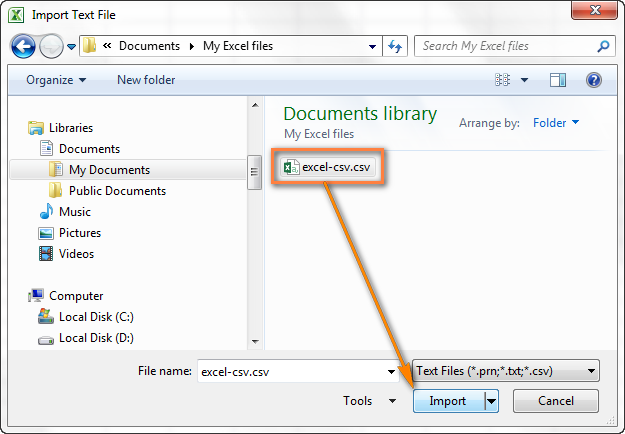 You can use this method to import the data contained in the CSV file into a new Excel Worksheet. 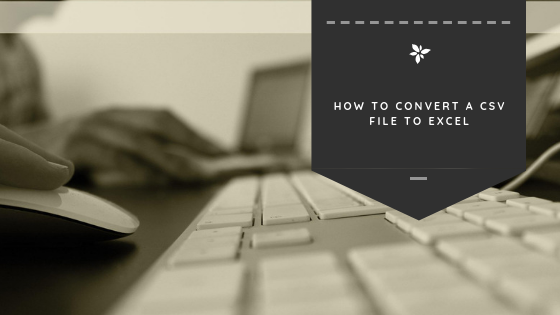 This method is different because it does not open the file in Excel but actually converts the .csv file to .xlsx or .xls, depending on your version of Excel. Step #1 — With the Excel spreadsheet open, click on the cell where you would like to import the data from the .csv. In many cases, this will be cell A1. Step #3 — Find the .csv file in your system that you would like to import. Then click the “Import” button, or double click the file in the window. Step #4 — Now, the “Text Import Wizard” will appear. Follow the steps that are provided on the screen based on how the information in your .csv file is laid out. Then we choose the delimiter information that we will use to help Excel import the .csv data. The delimiter is the character that is used to separate data fields in your .CSV file. The most commonly used .csv delimiter is the comma. Notice how this screen provides you with a preview of the data that you can use to ensure that you are importing the data correctly, using the right delimiters. Step #5 — Choose the destination for importing the information. This will be a cell in an existing or new worksheet. Click “OK” to finish, and you’re done importing! Converting a CSV file to an Excel (XLS) file is a relatively simple process using these two methods. These present the easiest and most straightforward ways to pull CSV data into an Excel workbook.